A week after Dantewada BJP MLA Bhima Mandavi was killed by Maoists in Bastar, Prime Minister Narendra Modi Tuesday called the Congress “supporters of Maoists and Naxalites” and said that such attacks were taking place because the Congress was “lifting Maoist” spirits through their manifesto. Addressing two rallies in Korba and Bhatapara in Chhattisgarh before polling on April 23, Modi began his speech by condolences to Mandavi saying his sacrifice will always be remembered. Mandavi, his driver and three security personnel were killed last Tuesday when their convoy was attacked by Maoists in Dantewada. “It is unfortunate that the attack happened in the area where the influence of Naxals had been brought down… The question is, why did something like this happen? You will remember when the Vidhan Sabha elections were happening, I had come here and I had drawn Chhattisgarh’s attention to the comments made by Congress leaders,” he said. Referring to the BJP, he said that on one hand, jawans are protecting the country and in tribal and backward areas his government had worked to prove roads, railway lines, mobile connectivity and industry. “On the other hand, they (Congress) are conspiring to push the state into a scary phase of violence. You need to be careful of these supporters of Naxalites and Maoists. The courage of the Maoists is also growing because of the Congress dakoslapatra (referring to the Congress manifesto),” he said. “In this election, the Congress has declared that if it forms government, they will remove the law of sedition. What is the meaning of this? The meaning is that those that are in the jungles and threaten those living peacefully in the tribal areas and their children, who for their own benefit arm them, these people will be given an open licence. The kind of strict action that our government is doing, that will not be possible. Should the sedition law be removed? Is the hand of the Congress with “vikaas” or with “vinaash”? Does Chhattisgarh want land-mines, or does Chhattisgarh want power and water pipelines?” he said. Countering Modi, Chhattisgarh Chief Minister Bhupesh Baghel said that it was the BJP that had “connections” with Maoists. “We lost our entire leadership in the Jhiram Ghati attack. In the case of Bhima Mandavi, the facts are clear. At 1 pm, he asked his security to return when he had full security despite police asking him to avoid that road,” he told The Indian Express. “But the bigger point is that we have already written to the Election Commission asking for permission to begin a judicial enquiry. Has the BJP done that on Pulwama? 40 jawans are killed when a car full of RDX can get through to a convoy. What inquiry has there been? And if there is an incident in Chhattisgarh and the PM says we have connections, does that mean Prime Minister Modi has connections to terrorists,” he said. 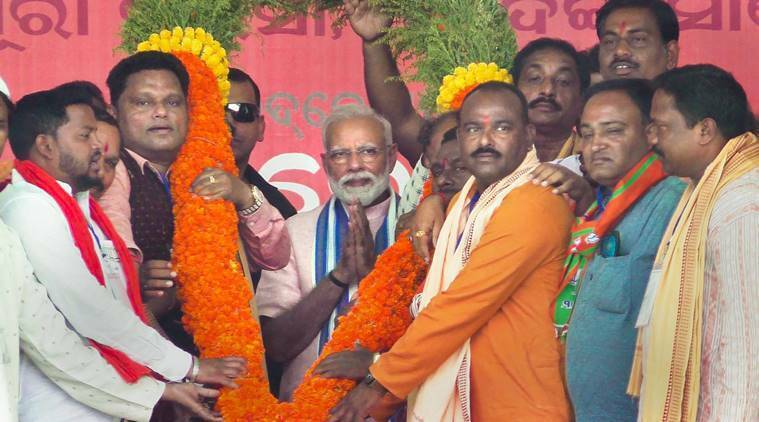 Later, Modi also addressed a rally in Odisha’s Sambalpur district, which votes in the third phase on April 23, where he slammed the BJD-led state government over the subsidised rice scheme saying the BJD was “shrewdly cheating people in the villages”.